Dhadak Movie Review: The film gets neither the love story nor the socio-political context of Sairat right. An attempted makeover of a tested storyline is never more than a handful of missteps away from turning into an outright mauling. The latter is exactly what Dhadak metes out to Nagraj Manjule's 2016 Marathi sleeper hit Sairat. A muddled screenplay, bland storytelling and uneven lead performances leave this glossy Karan Johar production without a proper, palpable heartbeat. With Bittergaon's Parshya and Archi, beleaguered lovers in whom we were deeply invested, giving way to a pair of prettified, pale shadows, it is only sporadically that Dhadak shows any signs of life. The rest of the 137-minute film can bore the pants off even the most indulgent Bollywood watcher. Neither the blossoming of the furtive and risky romance between two college mates nor their forced flight from their hometown when their affair is discovered by the girl's ruthless, class-conscious family springs out of the screen quite in the profoundly affecting manner that it did in Sairat, a film that drew much of its efficacy from casual, confident understatement. The world that Dhadak creates is too synthetic. It lacks the power to evoke empathy. In the original film, an air of dread and despair hangs over the young couple as they try to come to terms with their new life in Hyderabad. 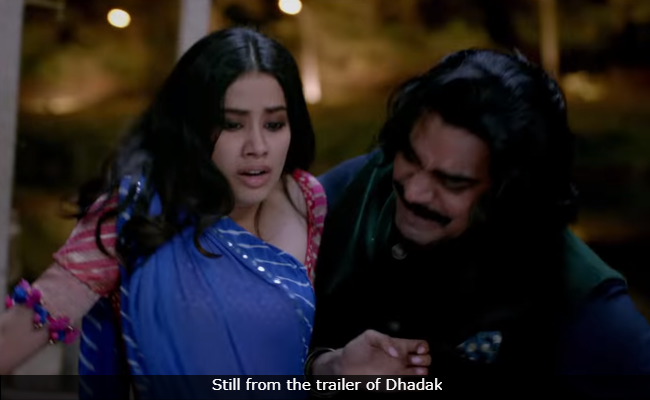 Dhadak's many ill-advised detours - narrative, ideational and locational - take the focus away from the plight of the lovers who are never out of harm's way even when they find what appears to be a safe haven a thousand miles away from home. The script by director Shashank Khaitan (Humpty Sharma Ki Dulhania, Badrinath Ki Dulhania) may well have been titled Madhukar Ki Dulhania. It deviates in major ways from Nagraj Manjule's trenchant, unfussy narrative built upon a keen personal understanding of the milieu that his film is set in. 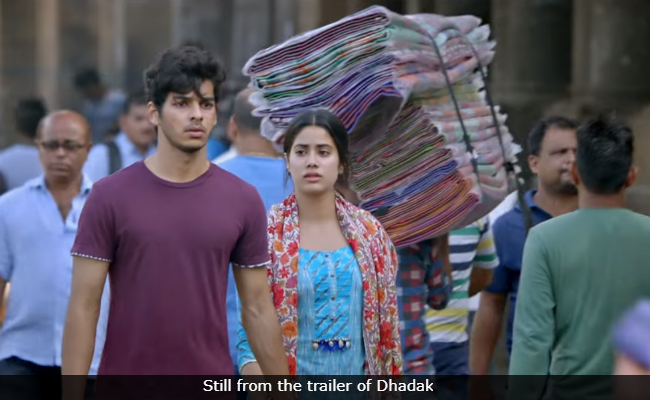 Dhadak transports the story to Udaipur, gives the two principal characters new names - Madhukar Bagla (Ishaan Khatter) and Parthavi Singh (Janhvi Kapoor) - and reduces to near-irrelevance the class and caste divides that the plot of Sairat swivelled around. This takes the sting out of the film's shocking climax. The problem with Dhadak isn't, however, limited only to a weak ending or to the immediate lead-up to it. From its awkwardly farcical opening sequence in which a bizarre kachori-eating contest replaces the village cricket match with which Sairat kicks off all the way down to the couple's relocation to Kolkata in the second half to escape the fury of the girl's livid father and belligerent brother, nothing that writer-director Khaitan rustles up is able to pitchfork Dhadak out of its comatose state. Just ahead of the first half's principal flashpoint, a stolen kiss that unleashes mayhem, all the principal characters, choreographed by Farah Khan, get together to belt out a robust version of the peppy Zingat. But what about some zing, please? That commodity goes completely missing from Dhadak. The onus is on Janhvi and Ishaan to tide over the film's drawbacks - they do not try - and enliven the wishy-washy proceedings. Dhadak is as dull as ditchwater. So no matter how hard the two actors endeavour to win us over with their vulnerabilities, which they do a pretty good job of harnessing, theirs is an uphill task. Pressed into the service of this enervated remake, their efforts are unable to guide Dhadak away from its inconsistent arc. The film gets neither the love story nor the socio-political context of Sairat right. The script makes too many gratuitous changes for its own good. Udaipur's Lake Pichola and the impressive structures around it add up to a visually striking backdrop, but they cannot compensate for the soulless nature of the narrative. The male protagonist's father, a lowly fisherman in Sairat, is a restaurateur in Dhadak. In one scene refer to the uchhi jaat (high caste) of Parthavi's family and warns him to stay away from the girl. Parthavi's dad isn't a big, thriving farmer like Archana Patil's father - he is instead a big-talking small-town overlord Ratan Singh (Ashutosh Rana), whose ambition is to dislodge a long-serving MLA from her perch and enjoy the fruits of political power. He does have his way but only to lose his seat before the film winds down. His anger shoots through the roof and the reverberations are felt in faraway Kolkata. By this point, the film has well and truly lost its way in bylanes that lead nowhere. The end result is a meandering mess that delivers a feeble statement against the horror of honour killings. But by reducing the socio-political subtext of the tale to a mere footnote, Dhadak deprives itself of the chance of breaking out of its dreary shell and bringing into its sweep the social faultlines that lie at the core of a complex, fragmented society. In Dhadak, Madhukar's sidekicks are Gokul (Ankit Bisht) and Parshuram (television's 'tiny man' Shridhar Watsar), who is charged with providing comic relief. Beyond that, the duo contributes precious little to the plot - the Dalit-Muslim-differently abled axis is done away with, and what is left of it is employed only for a largely superficial purpose. Gokul and Parshuram, in another key departure from the Sairat plot, do make a reappearance in the film's second half to lend moral support to Madhukar and Parthavi in Kolkata, where they are in hiding in a hostel run by a gentleman called Sachin Bhowmick (Kharaj Mukherjee). The name is obviously borrowed from one of commercial Hindi cinema's most prolific screenwriters, whose credits range from India's 1958 Cannes Competition entry Lajwanti to 2006's Krrish, with a wide array of megahits in the interim (An Evening in Paris, Aradhana, Karma, Karan Arjun, Koi Mil Gaya, et al). But that definitely isn't meant to be an inspiration for Dhadak to shrug off its inertia. The film saunters rather than sprints. In Sairat, that strategy clicked famously because that film had its heart in the right place. Dhadak doesn't. The result is a grind that pretty frames and fresh faces cannot mitigate.